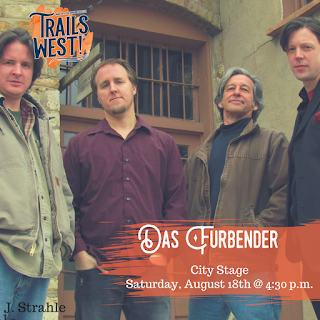 Get Ready for Trails West! If you’re living in northwest Missouri, you’ve probably already heard of Trails West!. After all, it is the largest arts and music festival in the area. Festival.net even said that Trails West! is “northwest Missouri’s premier event.” For anyone with a passion for arts and music, this festival is a must! Here’s more about this exciting festival. Trails West! is always the third weekend in August. This year, that happens to be this weekend - Friday, August 17 through Sunday, August 19. Friday night, the gates open at 5:00 p.m. and are open until the end of the Main Stage concert. Saturday, the gates open at 10:00 a.m. and are open until the end of the Main Stage concert. Sunday, the festival is open from 11:00 a.m. until 4:00 p.m. This year, there are three main changes to the admission policy for Trails West!. The biggest change is that Sunday is free! Unlike more recent years when you had to purchase admission to enter the festival grounds on all days of the festival, Sunday is completely open for the public to come and enjoy the artists, craftsmen, and specialty foods. Another change is in regards to the buttons. In previous years, the folks in charge of Trails West! would select art specifically in line with their theme for the year to adorn a button. This button would then be used to grant admission. While specially decorated buttons were really neat in 1993 when the festival began, they’re maybe less trendy now. The Trails West! committee decided that it was time for a change. This year, instead of buying buttons for admission, people purchase tickets that will be exchanged at the gate for admission wristbands. The last day to purchase advance tickets is August 15. 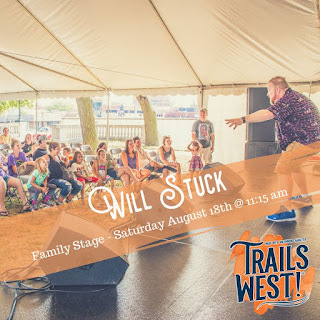 When you attend Trails West!, you can expect to see lots of arts, crafts, and entertainment. Throughout the whole weekend, area artists and craftsmen will have booths set up selling and displaying their pieces. I’ve seen everything from photography to logs carved by chainsaw out there. You can also expect to find interactive activities. There is normally an area especially for children to play and craft, and there are roving performers to entertain the crowd. One of the biggest components of Trails West! is the musical acts. Early Friday evening and during the day on Saturday, find entertainment on both the City and Family Stages. Click here to see the schedule. Then, in the early evening, enjoy the Main Stage events. This year’s Main Stage features Robert Randolph & the Family Band on Friday evening. Although you may not have heard of this band, several famous musicians have. Their soulful blues sound has encouraged vocal collaborations with Anthony Hamilton and Darius Rucker. These songs can be heard on the 2018 Grammy-nominated band’s newest album. Saturday evening features country performers Chase Rice and Faren Rachels. Faren Rachels will be the opening act for Chase Rice, a rising country star who is best known for co-writing the Florida Georgia Line crossover hit “Cruise” and for finishing in second place on season 21 of Survivor. I don’t know how they do it, but the Trails West! festival consistently delivers in providing the best up-and-coming country musical talent. Several years ago, I had the privilege of seeing The Band Perry perform before they became big hits. A few years before that, Taylor Swift performed. Could you imagine only paying $10 ($8 if you bought your button early) to see a star like Taylor Swift?! So, although these artists may not be on the top of your must-see list right now, you won’t want to kick yourself in the pants for missing them in a couple of years. If you have any questions about living in the St. Joseph area, contact Ramseier Realty Group. We’re happy to answer any questions you might have or show you some properties while you’re in town enjoying Trails West!. Visit our website or give us a call at 816.262.8077!